Because we have volunteers working at the farm, we always give them a briefing on safety and hazards before they start working. This makes sense to me because, as my osteopath can attest, the farm has lots of hazards and I have found most of them. Usually we’ve had professional park rangers lead the volunteer groups and they handle the safety briefings. But I decided it was time I started doing it, so a while back I duly registered for an Official Safety Course. The course took a whole day and it was one of those things that when you are finished, you wonder how the human race has survived for as long as it has. First, there are the stories of some of the, er, stupid things that people have done to injure themselves (trimming the bushes with a gas powered lawn mower is one of my favorites). Then there are some of the outrageous accident compensation claims that people have filed when, legitimately or otherwise, they have been injured. So I have learned to tell volunteers that they should try not to cut off their toes with the spade when they dig a hole to plant a tree, that muddy hillsides are slippery and that (most of us) aren’t able to walk across bodies of water. Oh, and that no one knows for sure, but it’s probably not a good idea to pee on an electric fence. We also learned how to do a “risk assessment” which is the process of identifying potential risks in a given situation. I am not a paranoid personality, but after going through the risk assessment “doctrine,” I seriously considered becoming a hermit. Everything can and will hurt you. And if you think you are safe, it’s only because you haven’t adequately assessed the realities of the situation. That innocent pile of potting mix is a breeding ground for lethal bacteria. That planting stake is a dangerous weapon in the wrong hands (incidentally, the sharp and blunt ends both present different risks). That empty flower pot can kill you if you’re not careful. What were they going to do? Visit a black hole? No. The presenter was going to point a radio telescope at a recently discovered planet to see if there were any inhabitants who might be broadcasting in our direction. I don’t know about you, but I’m inclined to think that such an exercise might have the same results as Geraldo Rivera opening Al Capone’s vault, but it sounds like an interesting experiment. But it was not to be according to the BBC legal department. Why? Because they have no health and safety regulations covering encounters with alien civilizations and therefore the risk was deemed to be unacceptable. I wouldn’t have believed it—except I’ve been trained to. This is probably true all over the urban US anyway. Young people don’t make things with their hands anymore unless you include typing. Sewing, carving, pottery, model building painting or just about any arts and crafts are no longer part our our teens’ routines. Teens are no longer exposed to the auto shop, wood shop, metal shop and graphics and arts as teens in school as was my generation. A screwdriver, hammer and pliers are about the only tools they could manage to use.Can’t use a simple ruler for anything either. 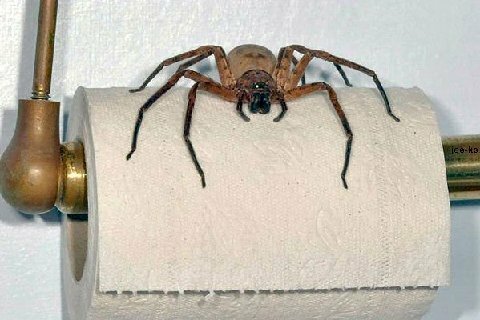 Spiders on the toilet paper? Worse yet, poisonous snakes living in the out-house. That photo is a classic. My engineer beau has to attend safety classes, where they solemnly trot out artifacts such as screwdrivers that melted in someone’s hand when they contacted the high voltage, complete with fingermarks clearly visible in the plastic handle. He mostly crunches numbers but anyone who goes on-site at the various power and HVAC installations he manages has to view such relics annually. So far as I know, however, no one has ever encountered the tribe of Ungoliant while exploring a boiler room. Brr..
Fingermarks in the plastic handle? I’ll take an Ungoliant any day. I love this story. Perfectly balanced and entertaining. Yes, rural living certainly has its hazards, but urban life has more threatening ones: humans… Give me a nasty raccoon, a baby rattlesnake, and a wasp nest over the glares and attitudes found on public transit in the Bay Area. Thanks Cheri. You’re right, four (or more) legged creatures pose less risk than the two legged variety. Yes, definitely a Darwin Award entrant! Only the British could name a planet Threapleton Holmes B, what? Yes, and doesn’t the existence of Threapleton Holmes B imply the existence of a Threapleton Homes A? If the aliens know what we’re calling their home world, maybe the BBC’s concerns have some substance! Yeh, which self-respecting planet wants to be a B-lister!! I once read about some sort of matter/antimatter experiment that, if something went wrong in the lab, might trigger a chain reaction that would cause the entire universe to annihilate itself and disappear in an instant. Safety briefings, I hope, are mandatory for scientists who intend to try it. LOL…oh my word. How have we survived for so long! 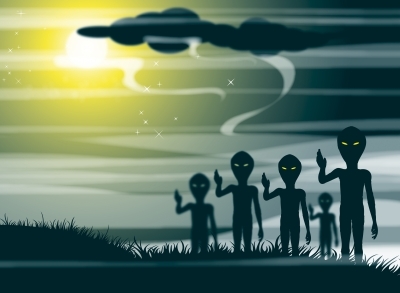 As for aliens…I mean seriously, the BBC aught to know better. Health & Safety gone mad….like the annual Christmas Pudding Race in London; this year the competitors were told to ‘not run too fast’ in case they fell. Come on!!! Where is the fun of a Christmas pudding race if at least one santa, reindeer or elf didnt have a spill? I love that story about not running the race too fast. Duh!